Season 2 of the worldwide smash is out on disc…and boy, if it isn’t a show after my own heart. The first eight episodes of this collection fix the one problem I had with season 1: the prolonged bouts of introspection that messed with the flow of the story. At the time, I assumed it was a cost-cutting measure – ensuring they’d be able to focus their resources on the high-octane moments – but apparently the incredible success of the show means they don’t have to worry about it much anymore. So season 2 starts with a bang…and never lets up. A horde of Titans is on their way to wall Rose, and Eren and the other scouts set out to meet their enemies head on. Except, this being Attack on Titan, it isn’t long before plot developments flip our understanding of the world upside-down. I can only assume that Hajime Isayama is making this stuff up as he goes, because the narrative shocks frequently feel like writing challenges. It’s all so completely nuts, and the show doesn’t pause to spend too long on any of these revelations, instead moving onto the next gory plot point. And boy, does the gore come thick and fast. The titans are as horrific as ever, and there’s some pretty amazing dismemberment on show. The action is incredible also, and it never fails to get your pulse racing during the battle scenes. You want to know how else AoT s2 was catering specifically to me? They gave us a Sasha episode! That’s right, the potato-obsessed scout is the focus of possibly the best episode of the season, which gives her a decent backstory too. 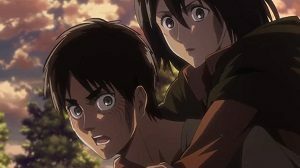 As much as we all love Mikasa – who, make no mistake, is amazing – I love that a character as offbeat as Sasha gets her time to shine. The narrative of season 2 overall is strong…up to a point. When we get to episode 34, the pace suddenly grinds to a halt, and the dreaded labored exposition rears its head once more. It’s almost as if the make-it-up-as-you-go-along technique has run out of steam, and the writer felt explanations were in order. As such, the season crawls over the finish line. It’s frustrating because, as I said, the first eight episodes are pure, unadulterated fun. Attack on Titan Complete Season 2 is available now on DVD and Blu-ray from Madman. This entry was posted in TV Series and tagged Action/Adventure, Anime, Fantasy, Horror, TV series by Stuart Wilson. Bookmark the permalink. Director: Hiroyuki Tanaka, Yoshihide Ibata, Kenji Imura, Hitomi Ezoe, Tetsuya Wakano , et. al.